TRUST MARK is a Government endorsed body which also carries out stringent checks on all work, construction practices and customer satisfaction. Technical ability is also checked by thorough on-site inspections. All of which is endorsed by such people as the Governments Consumer Minister, The Citizens Advice Bureau and the Trading Standards Institute. Which means we are licensed to carry out the work you want done to satisfactory standards. 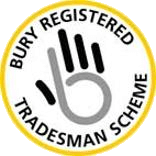 BURY REGISTERED TRADESMAN SCHEME helps residents avoid rip-offs and cowboys by providing a list of reputable businesses who can help make repairs and improvements to your home. Alexander Pointing Ltd is proud to be a member of this scheme. But words don’t make guarantees so we at Alexander Pointing Ltd have gone that final step to ensure you are completely at ease with our products and service. Because we are recognised and registered with both Fairtrades and Trust Mark it allows you to have an insurance backed guarantee that simply means in the unlikely event that Alexander Pointing Ltd should cease trading HomePro Insurance are able to provide an insurance backed guarantee on all of Alexander Pointing Ltd work for up to 10 years.